The Nunchucker Humbucker is an extremely versatile pickup, perfect for many styles. Ormsby Guitars, based in Western Australia, build awesome guitars with pretty much any spec you may ask for. Perry Ormsby, the owner of Ormsby Guitars also makes his own range of hand-made pickups. Perry was extremely generous and sent me two of his pickups to review. The first of those is the Nunchucker Humbucker. The Nunchucker Humbucker is a moderate output bridge humbucker with 9.3K resistance. It can come loaded with an AlNiCo 2, 5, 8 or ceramic magnet. The model I have to review came with an AlNiCo 5 magnet. It comes with 4 conductor wiring, so you can wire this up which-ever way you want. I loaded the Nunchucker into my custom Ibanez RG/JEM style guitar, which has an alder body, maple neck, rosewood fretboard, and Gotoh licensed Floyd Rose with a Floyd Upgrades big brass block. Acoustically this is a fairly bright sounding guitar, and I felt this would be a good base to test the Nunchucker Humbucker. Plugging in, the Nunchucker is a fairly open and airy sounding pickup, much like a classic PAF pickup, but it isn’t just another PAF clone. The Nunchucker has heaps of clarity, and note definition, but if you dig in it bites right back. Hitting the strings hard will overdrive a clean sounding amp. Play softly and you can get a bit of strat-like chime with the fullness a humbucker gives you. The Nunchucker really cuts through the mix, and doesn’t get muddy even with high distortion levels. It always retains its clarity, but never gets too shrill or trebly. It is great for both rhythm and lead guitar playing, although notes higher up the fretboard may sound a little too ice-picky depending on how you set your amp’s tone controls. Roll your guitar’s volume knob down and the Nunchucker cleans up really nicely. It does a great job of this, even with high gain tones. The Nunchucker is a very touch responsive pickup in this respect, and is a great bridge pickup choice if you prefer to rock a single channel amp, and use the guitar’s volume knob and playing dynamics to switch between clean and dirty tones. Splitting and combining the Nunchucker with your middle or neck pickup provides some great Strat-like combined single coil tones which work great for both clean and distorted guitar parts. The Nunchucker sounds great for blues, classic rock, more modern rock, punk and some more classic metal tones. If you’ve got a real high gain amp, or use an overdrive pedal to push your amp harder it’ll do more modern brutal metal tones too, although some may find that the clarity and openness of the tone may not suit some styles. Overall the Nunchucker Humbucker is an incredibly versatile pickup that covers so much tonal territory. It’s clarity and it’s response to playing dynamics make it extremely useful in so many situations. It’s ability to excel for so many styles makes it the perfect pickup for the player who loves to play a wide range of musical genres. Although it’s labelled as a bridge pickup I’m keen to try it in the neck position of a guitar just to see what it’s like there. I have a feeling it may be very useful in the neck in conjunction with a high output bridge pickup. 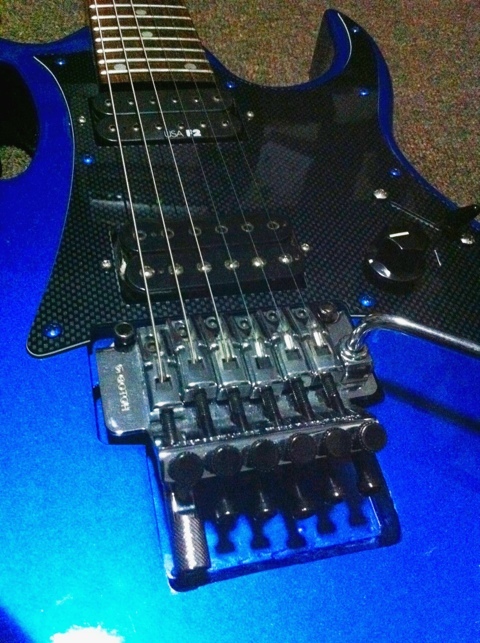 A big thanks to Perry Ormsby for providing the Numchucker Humbucker for review.